Ne nous asseyons pas ! Ne vous asseyez pas ! 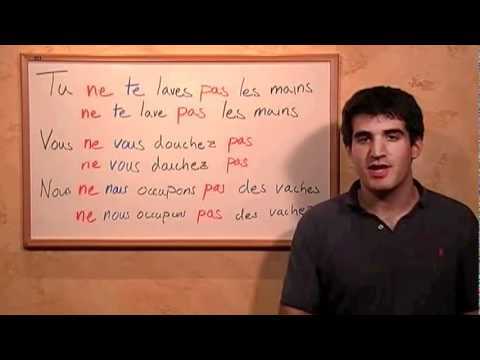 Notice that when forbidding (negative orders) using reflexive verbs, you keep the regular order of the words in a negative statement and simply drop the subject pronoun tu/vous/nous. e.g. Tu ne t'assieds pas -> (X) Ne t'assieds pas! Ne te couche pas ! Note that for -er verbs, you lose the -s in the 'tu' form. Should the translaten of "Don't go to bed yet" not be "Ne vous couchez pas encore" instead of only "Ne vous couchez pas" ? Methinks the "yet" isn't captured by the second translation. -- Chris. Sorry, my mistake. I just saw that "encore" is a given and mustn't be entered as part of the solution. -- Chris. The questions asked how you would ask "friends" and then gave the formal rather than informal answer as correct. Don't use the word friends in the question as you're misleading people in the question.